The winner of this giveaway – drawn randomly from the entries – is Rosemary Thompson. Thanks to all who entered! This week, BenBella, the publisher of my new book The Plant-Based Journey releases another title from their plant-based living collection. I love being able to give you these inside sneak peaks – along with sample recipes! And today’s preview look is no different. T oday’s giveaway is none other than the latest from Lindsay S. Nixon’s Happy Herbivore collection. Titled Happy Herbivore Holidays & Gatherings Easy Plant-Based Recipes for Your Healthiest Celebrations and Special Occasions, this book is just that. If you own any of the Happy Herbivore books already in print, it’s helpful to know that this book is partly new recipes, and partly a collection of previously published recipes organized in an easy-to-use fashion. Occasions: Thanksgiving, Winter Holidays, New Year’s, Tailgating and Appetizing Parties, Romantic Occasions, Breakfast in Bed, Easter and Passover, Picnics and Outdoor Parties, and Kid-Approved as well as Mixed Crowd Party Bars. First, West African Peanut Stew. I don’t know about you, but I can’t seem to take my eyes off this picture long enough to get up and cook it. 1. Line a large pot with a thin layer of broth. Sauté onion, garlic, and ginger until onion is translucent. 2. Add tomato paste, remaining broth, tomato sauce, 2 tbsp peanut butter, and pumpkin. Fill tomato sauce can with water and pour in. 3. Add sweet potato, a dash or two of cayenne, light dash of cinnamon, and bay leaves. Cover and bring to a boil. 4. Reduce heat to low and let simmer until potatoes are tender, about 7 minutes. 5. Uncover and scoop out bay leaves. Let soup cool for a few minutes. Stir in coriander. 6. Let cool for a few more minutes and taste, adding more peanut butter, tomato paste, or coriander as desired. Add salt to taste if necessary (the saltiness of peanut butters varies). 7. Stir in fresh cilantro as desired and serve. Garnish with peanuts and a sprig of cilantro on top to be fancy pants! For a full Kwanzaa menu, pair with Cornbread, mashed sweet potatoes, Baked Mac Bites, Deviled “Eggs”, and Creamed Kale or Black-Eyed Pea Collard Greens (all recipes in full cookbook). At first glace, this is a match for what I always enjoy – a short list of ingredients. The only thing you’d need to spend time on making is the barbecue sauce – but you could always go with your favorite commercial variety. For caramelized onions, cook sliced onion in a thin layer of vegetable broth until golden and translucent, in as little liquid as necessary, or bake until golden and crisp. 1. Name the holiday that is the most challenging for your food plan, and how you’ve successfully dealt with it. You can even post a recipe to help everyone else along! The winner will be drawn randomly from entries complete by midnight EST on Saturday, November 8. Must be U.S. or Canada resident to win. Can’t wait to hear about your successes and suggestions for tackling holiday feast challenges! P.S. Once you’ve entered, come by and tell about it on my facebook page, too. It helps get the word out! It used to be Christmas/New Year. We have a huge potluck-style gathering out of town (and because we’re traveling, we’re not expected to bring food). After the “buffet from hell”, where not a single item was vegetarian, let alone vegan, I decided to bring my own food. That was 5 years ago. Now, the family is expecting my dishes (I bring both a main course (or two) and dessert). I always come back empty-handed. Marie, thanks so much for getting things rolling so quickly! I know what you meant about the buffet, gads! Sounds like you do wonderfully for everyone at the table. Do you have a go-to main dish you like to bring? Thanksgivingat my sister’s home is a challenge. I bring a bean dish to fill me up and tide me over. I made Isa’s recipe for Jewish Chicken-style soup and it was dead on! our first vegan thanksgiving terrified me! I started early researching recipes and recreated favorite flavors with vegan recipes. Stuffing, sweet potatoes, green bean casserole, mashed potatoes, pecan pie, pumpkin pie. All were a huge hit. We did resort to a tofurkey that first time! This will be my first time hosting Thanksgiving!! And everyone’s very particular, but thinks they’re easy to please… Vegan, vegetarian, traditional all together. I’d love to make some of Happy Herbivore’s recipes!! It is Christmas for us – what we do is to keep the turkey for those who cannot do without – but make sure all of the other vegetables are butter / dairy free. Potatoes, cauliflower, broccoli, stuffing, peas, carrots – there is plenty to fill plates! Every holiday used to be challanging since my whole extended family are devoted carnivores. I now love bringing my great tasting and great looking plant strong dishes. I especially like happy herbivores mushroom gravey and mashed potatoes. Last Thanksgiving I made Chef AJs cranberry relish and it was a hit with the whole crowd! Believe it or not, it is my own birthday because I am usually not doing the cooking and relying on loved ones to make my vegan birthday meal for me. I am blessed that my daughters have stepped up to the plate and research recipes to cook a very lovely plant based meal. It helps me to be thankful and humble because they are young and have made some really lovely vegan meals for me on my birthday and Mother’s Day. Thanksgiving is very challenging for me. I go to my inlaws who refuse to include anything healthy or vegan I make. After 20 years of disappointments I have resorted to serving a Thanksgiving lunch at home and then going to their dinner and just snacking on something that I have brought along. Thanksgiving I’m always hoping to find something new or different that doesn’t require mushrooms as my inlaws hate them and I like to take food to not only share but so that I have something to eat there too.. In the past I’ve only made HH a Hippie Loaf in individual muffin sizes.. Again.. It has mushrooms. I think Thanksgiving because it’s all about the food and almost everything, including the vegetable dishes, seem to have animal products of some sort. (butter, cream, cheese) I think this year I’m going to focus on the artisan breads (or stuffing), potatoes and yummy salads that I’m pinning on pinterest! There really is an abundance of recipes out there so if we can’t rely on what others cook, we need to offer to bring the best dishes we can to the table and possibly convert more people along the way. Woohoo!! My problem area is Thanksgiving. EVERYONE wants “real food”! Ha! Being as we haven’t been eating this way for a long time I make sure to make half and half. The veggies and potatoes and stuffing are of course compliant with our WOE. But I do end up having to make a meat. Even my dessert is compliant though, so I guess one off course dish isn’t too terribly bad. I DON’T eat it however. This year I am going to try the deviled “eggs” that are really deviled potatoes! Can’t wait. Growing up, Thanksgiving was always a huge feast at our house with tons of family and food! So my most challenging holiday is Thanksgiving. I make all the sides vegan so all I do is skip the turkey and I’m good to go! All holidays are a challenge for me because we usually go to my brother’s house and he cooks high fat foods (butter on everything) and lots of meat. He’s been better lately. Now he offers some vegetarian options, but still they are high fat. I think the only way around this would be to bring our own food and share it. My favorite Thanksgiving dishes have always been sweet potato casserole, dressing and cranberry sauce, all of which can be easily made vegan. It’s a little awkward to bring my own versions of these when I know someone else’s omni version that they have made for decades will be there, too. Any holiday with extended family is a challenge because I am the only vegetarian! When I attend a gathering, I bring a beg dish and am careful in my dining selections. If I am hosting, I feel a bit more in control, knowing that all my food items will be veg, If an attendee ‘can’t live’ without some sort of meat, I encourage them to bring their own! This is the first year for me to prepare low-fat plant-based meal. I’m thinking it will be Thanksgiving. I’m looking forward to any help submitted. Thanksgiving is the hardest family gathering because I LOVE Mac & cheese but I am lactose intolerant. I live many states away from my family so I am not able to attend family gatherings but I found a vegan cheese recipe that uses coconut milk and nut yeast, pimentos and a little cornstarch to thicken as it cooks. when I am available, i make the sauce and add to macaroni and bake. It may be considered fattening so this is a treat. From the first Sunday in November to the first Sunday in January is a challenging time for me. Newly WFPB and the only one in immediate and extended family. 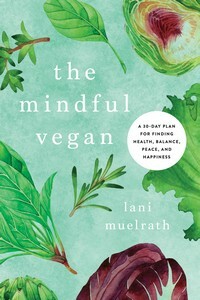 I rely heavily on Lani’s food suggestions and look forward to her new book. 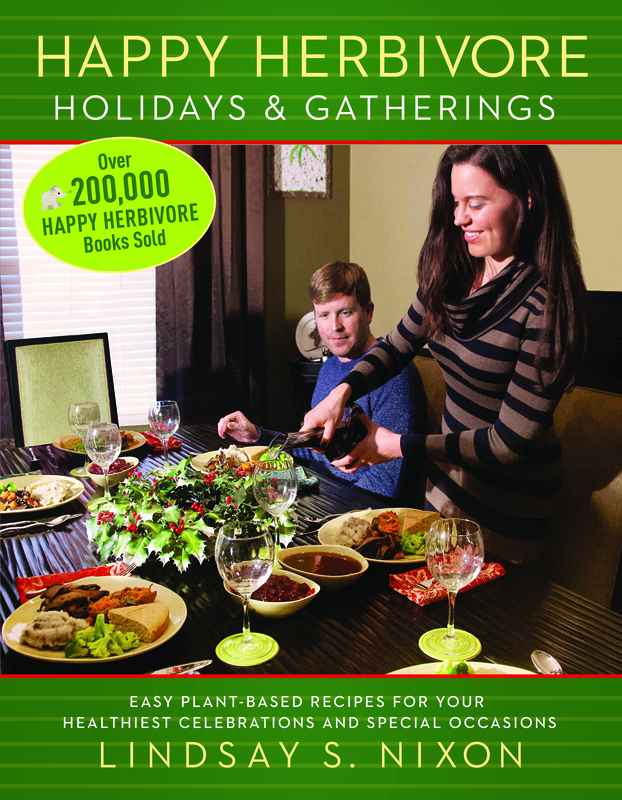 Winning the Happy Herbivore’s cookbook would be a great holiday treat. Thanks for the giveaway. It used to be Thanksgiving away, but that is now remedied by having this holiday meal at home. The carnivore in the group prepares a turkey but everything else is vegan. It’s a lot more work but fun to showcase how delicious vegan food can be! Any dinner at the in-laws! After a decade, they still don’t get it. They do try, but it’s just easier to bring my own. Last Christmas Eve I brought glazed acorn squash rings with a fruit compote, green beans with a lemony dressing, and chestnut stuffing. Easter can be challenging because I like to eat out that day but all the preset Easter menus do not offer vegan options. So, I stay home and make awesome food instead, ha! My most challenging holiday is Christmas. Mainly because of the parties and I’m the only vegan at any of the parties we go to. I now either eat before we go or bring my food depending on who is hosting. If it is a potluck I try to bring a vegan dish that will appeal to all meat eating friends and family. I host Christmas dinner so I have a challenge to find time to prepare dishes for them, for me and dishes that all of us will eat. I usually start preparing one or two days before. Treat bags, the candy is not a temptation and is easy to resist. Hardest occasion is a cookout at someone else’s home. I try to bring lots of crudités and fresh fruit to snack on……..
Thanksgiving is by far the hardest holiday. Before I went plant based it was a huge turkey feast with all the trimmings. Now, I have conquered this by making it a family event. I make a veggie lasagna and lots of vegetables and a huge salad. My daughters 23 and 12 handle all the desserts, it is great having us all in the kitchen together and after we eat we don’t feel yucky and in need of a nap, we talk and play games, it is a great time together. It’s a tie between Thanksgiving and Christmas. This is because it’s the same people at both holidays and it’s my struggle with family that has been challenging. If I go to a family member’s home I bring a crock pot with a hearty soup and that’s it. I don’t want to cook or need oven or prep space when the host is working to finish up the stuff they’re preparing for everyone. I feel satisfied. I’m out of the way and I can share with anyone who wants to try it. Right now I’m working on addressing the tension at holidays. That is the bigger issue. So, I am opening the lines of communication. Sending out emails in advance, encouraging family members to share what they plan to bring, letting them know I look forward to seeing them and catching up on their lives. I’m also trying to learn from the hickups from last year. Last year was the first year I firmly stuck to my food plan and I’ve been getting push-back ever since. Mistakes were made. It’s going to be an adjustment and my attitude can make a big difference in how that goes. Easter. Ham, deviled eggs, baked beans with pork, potato salad, creamed corn with sour cream and cream cheese, green bean casserole, cheesecake, etc–nothing ever was clean of animal products. Trying to incorporate foods that are totally plant based into some other host’s meal plan has been dicey. Yep, Easter is my toughest. As if Jesus himself needed ham! Our families must share recipies because I see everything on your list, and this is my year to host. 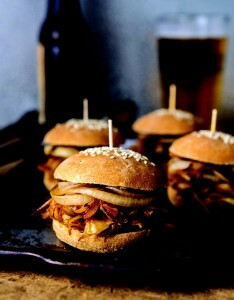 Help, any realistic alternatives to pork dishes? I can tolerate eggs for a day, but pigs are too dear to raise the ways we do. I may have to ask my sister to bring ham for those who need it and hope that appeases the negative vibe. I’ve found success at potlucks bringing yummy vegan hearty casseroles like Terry Romero’s enchilada casserole from Viva Vegan or the moussaka from Myra Kornfeld’s Voluptuous Vegan or Mark Renfield’s Samadhi Lotus Coco Rice from Vegan Fusion World Cuisine. I’ve also had rave reviews with this amazingly simple recipe that came in my CSA box long ago- roast potatoes & peppers (tossed w/olive oil or sprayed a bit) with a few cloves (or a head) of unpeeled garlic at 425 for 40-50 minutes until done. Then, squeeze garlic cloves into a bowl with some salt & Balsalmic and toss in a bowl with the potatoes & peppers. Add a chiffonade of basil if you have it. Thanksgiving with omni family members. Finding some recipes that my omni family would like to ‘replace’ the traditional meats, etc. has been difficult. We make enough plant-based dishes for everyone, but we finally settled on if someone is adamant about turkey, etc, then they can provide it. 🙂 Keeps everyone a little more happy. It must be Halloween. All that candy that needs be eaten. I just stay low and wait it out. Thanksgiving has been the hardest holiday for me. I opted to start a vegetarian/vegan Meetup group in the town I moved to 4 years ago and throw holiday potlucks and events where I could indulge in and celebrate plant-based, compassionate and eco-conscious foods with like-minded friends, and introduce the wonders of plant foods to others who were veg-curious or simply looking to make food choices more in line with their values. I love dressing or stuffing, but now being vegan, I experimented till I came up with a recipe I really like. I use canned veggie broth, which I add to dried bread, chopped celery & onion, sage & black pepper. The amounts vary depending on how many I want to serve. I add the broth to the other ingredients & put it in a crock pot & cook it on low a few hours, checking occasionally to make sure the onions & celery cook till tender, stirring & making sure there’s enough broth to keep it all moist. I season to taste. Since the bread already has salt added, I don’t add any more salt, but that’s just me. Many don’t want a moist dressing that doesn’t have a crust on top, & they can put the dressing in a baking dish & bake at 350 degrees till it gets brown. I serve with cranberry sauce , sweet potatoes, & all the other dishes that are traditional, like a home made green bean & mushroom dish with sauteed onions (in veggie broth till golden). Happy Holidays!!! Meeting with our family at any time is often full of challenges because of different eating styles and protocols. I would say that for a holiday that Christmas is the most challenging. What delicious plant-based dishes are there to offset all the rich Christmas desserts and junky side dishes? 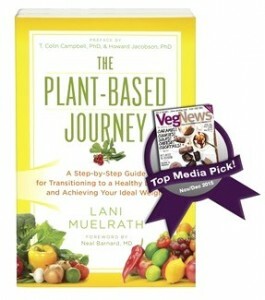 I love the Happy Herbivore and would love to have her book, to the benefit of our whole family! I used to dread Thanksgiving. But now that we host at our house, I can control the food and even opt to make other food to please my guests. It’s a win-win. Christmas – cook some dishes before and freeze. Christmas is the hardest. It spans over December and January. I don’t say yes to every dinner invite but rather suggest activities like shopping or a walk. I always try to mix things up, like with different ethnic foods. A favorite for Christmas is tamales, which take a lot of time, but can be made really healthy without any animal products. Always a favorite! And for Thanksgiving, I always prepare my own veggie loaf, but if someone needs turkey or ham, they can bring that along. It all works out! For me, any holiday where we are invited to someone’s home or to eat at a restaurant is difficult. Even the vegetable dishes are usually smothered in oil and salt. If we’re invited to someone’s home, I do bring at least 2 dishes that are consistent with our WOE in sufficient quantity for everyone. If invited out, I try to find out what the menu is and whether there is something we can eat – often in the giant holiday buffet meals, there’s really not much of anything we can eat and, sadly, we decline the invitation. Work-related potlucks, especially the one at Christmas. Just because I’m WFPBNO doesn’t mean I’m not addicted to the SAD food I used to eat. That, plus the torture the animals went through, make these events very unpleasant for me. All my coworkers seem determined to out-butter, out-sugar, and out-oil everyone else, so there’s never anything that I can eat to be part of the group. On the flip side, I love the holidays for experimenting at home with things that I will love to eat. Stuffing, gravy – some things I don’t normally eat, but have fun with at Thanksgiving and Christmas. I find family Christmas to be the most challenging with an extended family who think I’m weird for not eating meat and dairy. We traditionally had turkey. So I fix all the side dishes (vegan versions) including a veggie loaf and now I give in and have my sister-in-law bring a turkey(fewer comments about how its just not Christmas without a Turkey). I don’t tell that there is no dairy in my food and they don’t notice the difference. I also stuff a pumpkin (with cornbread stuffing) for a centerpiece. They gobble is all up. Any holiday with extended family where I’m not hosting is problematic. They keep thinking “vegan” and don’t get the “no oil, no salt” part of it. I feel badly that they go to the trouble to make a dish especially for us to eat, which we can’t eat because it has “healthy olive oil” over it. For Thanksgiving, which my brother now hosts, I essentially bring an entire meal for us. I make a lentil or chickpea loaf, mushroom gravy, a vegetable side dish and a pie. My son is about to marry a vegetarian who happens to be lactose intolerant, so the fiance’ appreciates our dairy and butter-free food, all of which she can enjoy. Now that there’s 3 of us, I might be able to convince my brother to make the mashed potatoes with soy milk and no butter. If not, I’ll continue to bring a rice/chestnut stuffing we love, and colcannon, a dish of potatoes and kale mashed with caramelized onions and garlic. Otherwise, at other people’s houses, we eat beforehand and just try to enjoy the company and find a drink we can have. I always bring a tea bag for myself. Thanksgiving was the first time we revealed our vegan diet. It came as a shock to everyone in the family. Since then it’s gotten better as my sister-in-law eats mostly plant-based as well. My hardest this year has been Halloween. So instead of feeding the kids in my neighborhood I took a midnight walk along the C & O Canal, special permit hike. Christmas is tough with exchanging foods and having them around. I tweaked some recipes of cookies, muffins and sweets so that there would be treats, but this year I’m focusing on more exercise and less sugar. I always appreciate the Thanksgiving planning by Mary McDougall so that it is a lot easier to do. The most difficult holiday gathering for me is Thanksgiving! In the past, I have completely skirted around having a ‘turkey element’ by focusing on the sides. I’ve made stuffing, gravy, potatoes and veggies. I would love to find a substitute for the turkey that would go well with the sides and could be covered with gravy! I’m hoping it won’t have lentils or nuts – my body does not like them. I find that Thanksgiving is the most food based so the most challenging. I always eat my largest meal before I go, so my hunger is very low. I bring three things as opposed to the one requested, so I have what I would normally eat with me anyway. My contribution is: a raw kale salad with avocado dressing, roasted vegetables, and a vegan cheese potato/broccoli bake. There’s food to share… for those who dare ~ and I’m all set! Any holiday is a challenge with a family of omnivores, but this year the vegans in the family discovered a great new recipe that I think will become a tradition. It’s Artichoke Spaghetti Pie, from Robin Robertson’s One-Dish Vegan. Spaghetti seems too humble for a holiday, but this was special with lots of kalamatas and artichokes, and the overall flavour was delicious. Highly recommended – the whole family thought it was delicious, which presents problems for the leftovers you were hoping for! This is my first holiday season as a plant based whole food person so I’m feeling a bit intimidated by them all. I’m planning on keeping it simple and just I make a few dishes. I agree with Karen; sometimes well meaning relatives just don’t “get it.” They understand the “no meat” part, but think the fats and sugars and processed foods are all fine. I have a sister who even seeks out “real” shortening because the non-hydrogenated stuff doesn’t make as good a crust or cookie in her estimation. Also, some folks amazingly think chicken and fish are vegetarian. And surely a little bit of butter and cheese won’t hurt! Lucky for me, the younger generation of my family is going veg, and we have been able to convince some of the older folks who have diabetes and heart disease to try to eat more plant based. So I’m not the only wierd aunty at the table any more. Any holiday where there is a tradition of what you “must” eat is problematic. But there are plenty of alternatives. We have resorted to Field Roast for Thanksgiving in the past, but it is high in fat so we are looking for a home made alternative. Non fat mushroom gravy is great and is now more popular than the ‘real” thing. Someone else mentioned colcannon, and others have mentioned stuffed squash, all of which have been a hit with the omnivores as well as the plant eaters. Easter is the hardest one for me. I haven’t figured out how to deal with it fully yet, so I just end up making non-traditional foods that I like. I hope to someday figure out a more traditional vegan option, still working on it, though. The holiday that is most difficult for me is Christmas. The old tradition for Christmas morning was to eat candy from our Christmas stocking until brunch….eat, eat, eat. Worst of all it was all the wrong food for a healthy diet. Last Christmas we started going for a long walk first thing in the morning. After starting the day with a healthy alternative, I didn’t want to mess it up by eating the wrong things. I made sure to have healthy snack foods available and it was the first time I didn’t feel sick the day after Christmas. Thanksgiving is by far the most difficult for my family because we have a mix of WFPB and omni’s and the omni’s are so close minded that we have to label our food separately because they might die if they accidentally ate it. Lol We just do our best to prepare enough for both mixes but, would love to have more dishes that fit both without having to label it separately. Any holiday can be hard if you look at your food choices as being deprived of something. 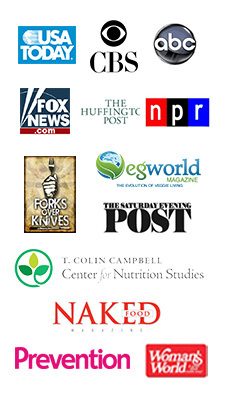 I moved to a complete plant-based diet in 2012. Since that time, I’ve refused to feel deprived or look at my food choices as being unable to eat certain foods. Rather, I choose to see all that I have available to me to enjoy: all the wonderful, colorful and nutrient rich foods available out there are so abundant. When I attend functions, I make sure that I bring all kinds of things so that I have choices at the table. Main dishes, salads, side-dishes and desserts, and whatever I bring I make sure all are able to enjoy as well. I check-in about food allergies, etc. Being the only vegan in my entire family makes all the holidays difficult as we usually host them because we have 6 kids. The family wants the traditional meals so up to now I have been making vegetable plate and dips for appetizers for all. For dinner I usually just eat salad or veggies. The longer I am on the vegan journey (currently 2 years) the easier it becomes. Especially as I become more adventurous with recipes. Thanksgiving has been the hardest since switching to vegetarian lifestyle 4 years ago. So far, I have not been able to get my entire amily on board of NO turkey. I don’t cook it, but it is still there. I think it is Christmas because we always go to an relative’s house that has Paleo kids so the pickings are a little thin on the ground. No problem, we eat before we go and make something yummy and plant based for dessert. Thanksgiving and Christmas but it’s the desserts that I have trouble with. We have wonderful vegetable dishes and I have no trouble with ignoring the ham or turkey but I need ideas for delicious plant based desserts. I find Thanksgiving to be the most challenging of holidays. All of our friends and family are omnivores and LOVE their turkey that day. We usually have different people offer to bring different dishes, so let the omnis bring their turkey and oyster dressing. We fix plenty of veggies so we are all happy. I think Christmas Eve is the most challenging. I usually host an appetizer kind of meal. The challenge is that our taste buds have changed while others are expecting the old spinach/artichoke dip and cheese ball. I have dealt with this by making their favorites AND ours. I would love some new ideas from HH!!! Thanksgiving stuffing, which we used to make with chorizo sausage. I now make it with Cremini mushrooms and onions and it is so good! The most challenging holiday for me is Thanksgiving. I’m the only vegan in my family so all the traditional foods are expected. In order for me to have great things to eat I have to make the whole dinner at my house including the turkey. I make sure the mashed potatoes and gravy are “veganized” and modify other dishes as necessary. The only thing I miss are the butter croissants, but I’m working on creating them without butter! I’d love to get new ideas from this book and maybe convert a few relatives!! Thanksgiving is the holiday that convinced me to go plant based. I was doing a kosher meal so NO DAIRY could be in anything. All desserts, side dishes were vegan…everything except the turkey. Look up parve (neither meat nor dairy) meals in a Jewish cookbook and you’re good to go. Hardest for me is Christmas with all of the holiday parties and gatherings, even lots of food at work. The strategy that’s working for me it to keep “dangerous” foods out of the house. I allow myself a sample of sweet treats when I’m out, and don’t bring them home! I’m already planning the dishes I’ll be bringing to family gatherings, like fresh kale salad and a sweet potato dish. More ideas are always appreciated though! Easter! Candy, hard boiled eggs, and ham seem to be the SAD Easter fare. I can do hh deviled potatoes and strawberry shortcake, but i have no clue what other plant-based goodies to make for this holiday. Need a good traditional meal. Christmas is the worst. I always eat too much and things that I shouldn’t. I haven’t had a successful year yet! Jewish holidays are the hardest for me. So much involved with traditional foods – brisket, chicken, pot roast, chicken soup, latkes ! Last year I made baked latkes instead of fried and a couple of yummy veg side dishes. I’d love to see what Lindsay suggests as I want to have our family and friends at our home this year but I need more than 3 dishes…. Christmas I think, this is my first year being vegan and I’m not sure how to handle it. We have a huge family gathering at our house and everyone expects the homemade italian sausage that carries on my Dad’s tradition. I think I will make the vegan spaghetti and “meatballs” and have the sausage on the side for those that need it. Thanksgiving will be hard since we have to go to our daughters and nothing is healthy there. If I had it I would do a pecan loaf for the main and of course the side dishes are easy to veganize!! Thanksgiving AND Christmas are at our house this year !!!! Hubby and I are the only ones that are WFPB…wishing they all were 🙁 So even though I will let them fix roasted beast of some sort…I would LOVE for everything else to be WFPB and WONDERFUL so they can see it is really a great WOE 🙂 Happy Holidays Everyone !!!! My pleasure, Lindsay. Thanks for coming by and leaving a note! My 15-year-old niece has been eating a plant-based diet for several months now. She has lost weight, feels fantastic and is an inspiration. This will be her first vegan holiday season so I am trying to find ways to replace the usual unhealthy fare and start some new traditions. I think Thanksgiving will be the most challenging and exciting at once. We have been looking at vegan pumpkin cheesecake recipes and trying to decide whether or not to try Tofurky (leaning towards not since there are so many great veggies and grains which lend themselves to cold weather comfort foods. Thanksgiving has always been my favorite holiday! Food, family, friends and fun! this will be first Christmas with my family eating healthy. Give me strength!!! I don’t actually have a “hardest” holiday yet. I pretty much just make sure there’s something I’ll enjoy while everyone else is having the traditional meals. I’m hoping the the HH recipes, I can convince some family members to enjoy my food too! There isn’t one holiday that is harder than the others! But, I’ve discovered if I bring a dish or two that I know I can eat then I am covered! 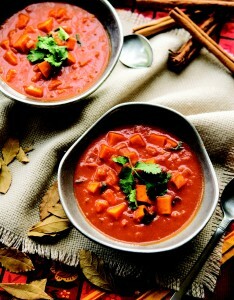 This West African Peanut Stew sounds like a good one for Thanksgiving. I really am into pumpkin right now! Yom Kippur (Jewish holiday) is the most challenging. Breaking a day of fasting traditionally includes dairy and fish. I make it work though!